When clients complain of over-thinking they are usually preoccupied by their constant stream of inner chatter and this can adversely affect their ability to give their full attention to whatever is going on around them. 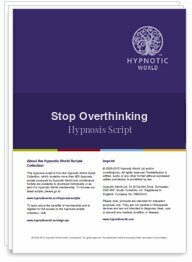 This Stop Over-thinking hypnosis script uses a metaphoric journey to guide the subconscious mind into a new pattern of thinking. Of course, there will be times when your client does need to think something through thoroughly or analyze a situation and the script allows for this, however most of the time, over-thinking just gets in the way and stops your clients from fulfilling their potential.